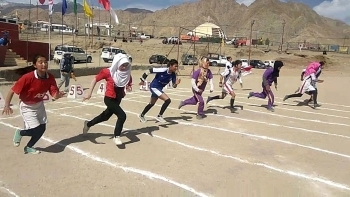 LEH: The three day long inter-school athletic meet for middle and high schools concluded on May 16 at NDS sports complex, Leh. Schools of Chuchot, Kharu, Nyoma, Durbuk zone and Hr. Secondary schools of Leh district participated. Dorjey Motup, CEC, Leh chief guest said, “Each year we get to see students taking part more in sports and performing well at all levels. But still, there are some schools that are weak in sports activities which need to gear up and do well in the future”. He said that Council is determined to promote sports in the district and efforts are on to complete the indoor stadium at the earliest. “Under Khelo India, Govt. wants to improve the sportsmanship among the students. We have to build the capacity among the students and produce the best sportsperson to compete not only in the district and national but at the international level”, he added. Tsering Tashi, Special Officer, Youth Services and Sports office, Leh expressed his gratitude for the enhancement of funds for the Youth services and sports. He ensured to organise more such athletic meet in the near future. He informed that he would start to take performance report of PE teachers and masters and accordingly they will be rewarded. “The funds can be enhanced more if we utilize the existing fund judiciously and show a good result," he added. In the end, certificates and medal were distributed among the winner and runner-up teams and individuals.